slamjim: Hope you next show the Wacky Packages Old School 7 entries paintings that spoof Shogun Warriors, Good Housekeeping, Chocks, Solarcane, and Space Food Sticks. I was able to procure a $150 set via my grandparents as a Christmas gift. I would like to trade all of my ludlows to simply complete the pencil set. Not sure anyone on here would like to do that though, unless the stars align. Good for you, and Merry Early Christmas!! Check back when we have all received our sets, and then we'll all know what we have to trade. Hopefully Topps will do a good job with "A" and "B" sets of the roughs, and someone will end up with exactly the 15 you need. Got to love a good Wacky bottle! Exceptional work! Many of the OS7 products here I barely remember, let alone remember at all. It seems that with each new old school series, the pickins are becoming slimmer than before in terms of familiarity. This is not to impugn the artwork and/or gags; They remain top-notch. Agree with this sentiment. Could be a regional thing, or maybe a broader spectrum of products that we don’t remember from back then, but for me there have been a few unfamiliar products throughout OLDS, more so in this series. It’s almost like looking at the Irish Wackys - very well rendered but completely unfamiliar. While I still find it all fascinating, I hate to think of all the great kiddie product choices that will fall by the wayside should the OLDS run end anytime soon. Repeat parodies of awesome package designs parodied in OS also holds potential. 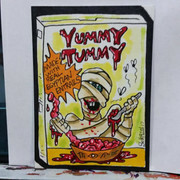 Speaking of products that we'd like to see parodied - I'd like to see Yummy Mummy. I believe every other Halloween cereal character has been done. I was actually thinking of making a parody of Yummy Mummy like, say, Crummy Mummy. Just never got around to it. If Topps green lights Wacky Packages Old School 1980's edition. Remember, you are also looking back on WP with rose colored glasses. I guarantee a ton of the OS series you have or had no idea what the product was. Especially as a kid. You only know them now because of the OS series. I thought the majority of these were really common things and if not they were still highlights of many 70s nostalgia sites. I try to check through those when doing these to get good ideas. A lot of these products are still in use today. The only one I never saw was Joan of Arc Beans (which is still around). I used it because Jay did a nice rough for it and it was a staple for him in the 70s. Chocks was the other one I was vaguely familiar with but it was a pretty big vitamin brand. What here have you never seen? Yes, Dave, love the bottle. Great work! IIRC, that's what happened to the OS run. The products were becoming too obscure in the later series and, from what I remember, that was one of the reasons for the decline in the 1970s. This was, of course, mostly due to the C&D problem. Ah, McSnoremick is official at last! And I just got a real good laugh out of Drunkula! I really like Corpse with the old pull tab on top. Well done. I think my fav so far has to be McSnoremick. Great detail on the can, and a simple, funny Wacky. I think this one perfectly captures the Old School theme. I much prefer the simple gags and art to those that are too busy. Dummy Mummy was done in one of the Halloween Packs 'O Fun (that doesn't mean it couldn't be done again, though) and a non-Topps parody series might've done "Scummy Yummy Mummy". I'll check up on that one. UPDATE: I found it! It's in lostwackys.com under the section "Non-Wackys" and in the subsection "1997 Freakie Magnets". You're right, Mark. The OLDS run has already done the four versions from the 1970s, the ANS run has done three different versions of the three that are still around, each in three separate series, and one of the Postcards series did all three of them in it as well. In fact, Franken Berry has been done several times-more than any of the others. I guess it must be the most popular of the three. Dave you make a good point, and yes, it did cross my mind that the OS had its share of out-of-leftfield products, but it still feels like a very small fraction compare to the Old School now. I guess I’m just applying a slightly warped or biased standard now. The last batch of spoiler images rings much more familiar. All in all looks like another outstanding set. The Hot Tamales parody speaks more to my internal wishlist, but I understand, you have to have some balance between grocery, sundry items, kiddie stuff, etc. To mikecho’s comment about Old School possibly following the trend of later OS Series in terms of having to go more and more obscure with the product types, I’m not sure if I agree with that, because OS was pushed in that direction due to parent companies issuing C&D requests, which wiped out entire swaths of products from consideration, but I think that’s all off the table now. Don’t know for sure though; seems Topps has steadfastly kept silent on the whole C&D issue since ANS started in 2004. My guess is that Topps lawyers successfully got this matter ruled on in their favor in the courts before proceeding with anything. OS6 spoofed Aurora's Frankenstien kit and OS7 spoofed Aurora's Dracula kit. Will OS8 next year or so spoof the Aurora Wolfman kit and/or Aurora Mummy kit? You're right; I completely forgot about the C&D problem. I should've mentioned that when I made my statement. In fact, I just fixed that right now. UPDATE: I just checked up on something that I remembered from lostwackys.com (which means, from what I've seen and heard about that website so far, it should be taken with more than a shakerful of salt). Anyway, in the Lost Wackys section on the website under the listing for ANS1, 3 Racketeers was intended to be #55 in that series, but was dropped before final production due to a complaint from M&M/Mars. As we all know, it was then replaced by Snots. The C&D is no problem anymore. We only really had a few minor issues since ANS started up. I think I still have a lot of good products left. A few of the categories are thinner than others. I guess I can always do more toys/ candy/ cereal rather than pull a more obscure medicine product for instance. I just always like to mix up the categories. If there is another set I definitely plan on continuing the Aurora kits. I did this with the monster cereals. I also have some more OLDS roughs Jay did that we hadn't used and will do some more of Jay's 70s roughs. Dave - will you be posting the real product images at some point? Chocks looks absolutely awesome, but it’s a bit frustrating to not have that instantaneous recognition. Sorry, guess I wasn’t keeping up with this thread as well as I thought! Also, kudos for continuing with the Aurora model kits. Not only do I love complementary Wackys all belonging to a family of products, like Hostess for example, but this plays beautifully to the spirit of monster-themed Wackys. And no need to embellish with a monster character - they’re already there in the product! I like to think of them as the perfect marriage between Wackys and You’ll Die Laughing / Creature Feature. 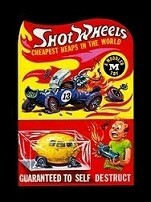 You've done some pretty iconic toy parodies in Old School, and I've liked them all. I'd love to see some more - have Sizzlers or Verti-Bird been done yet? My apologies if I've forgotten. Wow Slim jim this new batch of old school cards is great! Favorites to early to say but Dead berry, Chunks, Corpse, Shot, Sir ape, and Old Gods look like winners. I hope I can scrape up the150 set! I just saw that this is the second time that Coors Beer has been done. The first time was in the 1991 series as Coorpse Light. Also, I never seem to get a "New Posts" face whenever I put in a new post. Can this be fixed, please? Do I recognize EVERY single product? No. Did I recognize every product in the Original Series when I was kid in the 70's? No. That didn't make me like those Wackys any less then and certainly doesn't now either. I guess what I'm saying is: these Wackys are great and I can't wait to get my hands on them! That's how I feel also. The set looks better than ever. Hoping for an OLDS8. That is irrelevant, however. The main gist of my post was to push for the old school 1930s set with iconic characters, albeit vintage. I think it's a clever and fabulous idea that you had, Dave, and it would be nice to see such a set surface between now and next autumn. Or maybe I'm in the minority, here. I remember puking up a bowl of Grins smiles giggles and laughs when i was about 7. My Vomit had happy faces in it. You have no knowledge of, or experiences with, Superman Underoos?!?!? You poor, deprived child. 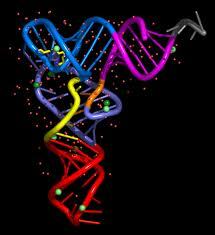 It's a miracle that you survived into adulthood! !